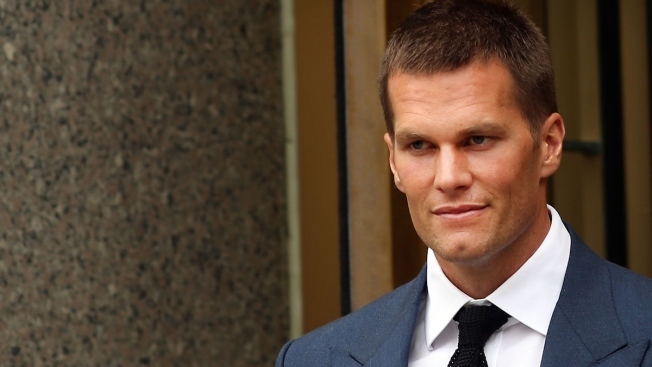 Quarterback Tom Brady of the New England Patriots leaves federal court after contesting his four game suspension with the NFL on August 31, 2015 in New York City. The "Deflategate" appeal could be heard as early as Super Bowl week, according to an expedited appeal process that was approved this week. The NFL had asked the 2nd U.S. Circuit Court of Appeals for an expedited hearing in its appeal of a federal judge's decision to nix New England Patriots quarterback Tom Brady's "Deflategate" suspension. Brady and the union agreed with the proposed schedule. The appeals court approved the expedited schedule on Tuesday. The schedule calls for the NFL's opening brief to be filed by Oct. 26, 2015, and Brady and the union's answer to be filed by Dec. 7. The NFL's reply brief is then due by Dec. 21. The appeal could be heard as early as the week of Feb. 1, 2016. Super Bowl 50 is scheduled for Sunday, Feb. 7. U.S. District Judge Richard Berman lifted Brady's 4-game suspension earlier this month, saying NFL Commissioner Roger Goodell dispensed "his own brand of industrial justice" when Brady was punished for using underinflated footballs in a game during last season's playoffs.